Volumes 1, 2, &3 have been updated. The same files will be updated on scriptures.info very soon. 20 Neither pray I for these alone, but for them also whom shall believe on me through their word, that they all may be agreed as one, as you, Father, are in me, and I in you, that they also may be agreed as one in us, that the world may believe that you have sent me. And the glory which you gave me I have given them, that they may be agreed as one even as we are one: I in them, and you in me, that they may be made perfect in agreement as one, and that the world may know that you have sent me, and have loved them as you have loved me. 1 John 1:22 - ...And it is the Spirit that bears witness, because the Spirit is truth; for there are three that bear record in heaven: the Father, the Word, and the Holy Ghost, and these three are agreed as one. And there are three that bear witness in earth: the spirit, and the water, and the blood; and these three agree in one. If we receive the witness of men, the witness of God is greater, for this is the witness of God which he has testified of his Son. Where is Skousen Coming From? As more people take a critical look at the scriptures, some understanding is needed. Royal Skousen did a marvelous job of analyzing the variations in the different editions of the Book of Mormon and trying to understand how they came about. But he also had a particular agenda - to get to the most accurate copy of the Original Manuscript (OM). This is a different goal than ours - the most Joseph-accurate copy of the Book of Mormon. Whenever Joseph made a change to the text that is found in the OM, Skousen set it aside. If it doesn't match the OM, he felt it shouldn't be there. Skousen has published his own version of the Book of Mormon that matches as closely as possible the OM. The problem for us is that this ignores 2 things happening through Joseph. First, he recognized that a lot of mistakes were made, both in recording the OM, and then in the transcribing of the OM to the Printer's Manuscript, and then to subsequent published editions. Joseph spent time throughout his life seeking to correct those errors. As late as 1842 he noted in his journal that he was working to fix the errors. Second, Joseph was ever learning. And as his knowledge increased, so did his understanding of the meaning of scripture. For example, Denver has given a good explanation of how Joseph's perception of the First Vision evolved over time. A more recent example that we can likely relate to is found in Nephi's discussion of his father's vision with an angel. At one point the angel says, "And he said unto me, Behold, the virgin whom thou seest is the mother of the Son of God, after the manner of the flesh." For most of us, we understand that the angel is referring to Mary, Christ's mother in the flesh. But read in the context of the talk Our Divine Parents that Denver gave in Phoenix in March, a second meaning appears - that Christ's Heavenly Mother may have condescended to be His mother in the flesh as well. So not all of Skousen's recommendations were adopted. Please recognize that though we might find a few things that got missed, overall we won't be changing a lot. At times we had to make some tough decisions and many, many were discussed by all of the committee and decided by mutual agreement. Now that we have a working set of scriptures, the final goal is to have the reasonably best set we can have by cleaning up the problems we run across. Some of them have been created by software, some by human error, some intentionally by well-meaning volunteers who decided to make their own changes. We're just now seeing these as people submit what they consider problems with the text. We will take as long as is necessary to make the reasonable updates in preparation for the fancy set of scriptures, at which point we expect updating will end (except for new material). The timeframe rests with all of us: as fixes keep coming in, we have to expect that there may be more. But you need to reference the TYPOS AND ISSUES doc to see if they have already been submitted. Once we have a few months where few, if any, fixes are submitted, we will feel confident that we've made it to a publication point. "Reasonable" was intentionally stated because some submitted fixes are very subjective and hard to justify. So please give solid evidence that a fix really does need to be made - do the research first. Links have been provided to all the material we've used. 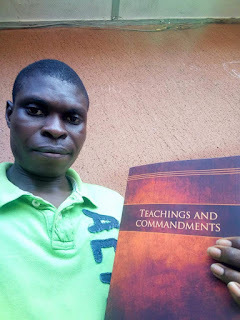 When he was a member of the Church of Christ, a brother in my local fellowship made the email acquaintance of a Nigerian man named Adefelu David Adebowale. David teaches at a little church school in IIe ife, Osun State, Nigeria, a day or two out past the middle of nowhere. There are 100 souls in their little fellowship of believers in Christ. 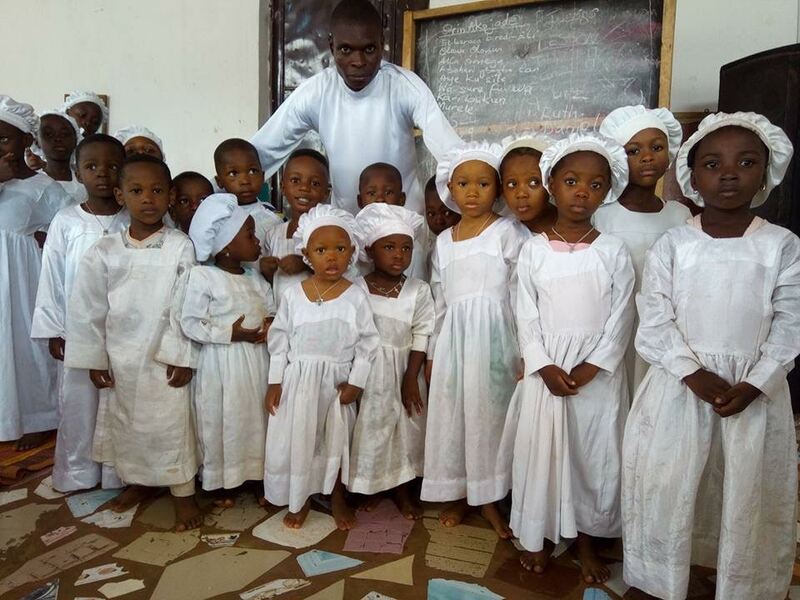 Here's David with some of his students, dressed as they are, like wee angels. One day David asked my friend, Tony, if Joseph Smith has light brown hair. David described having seen Joseph Smith in dreams since he was five. His testimony to Tony: "Joseph is a very sacred prophet like Moses and Abraham". Years ago David came by a few photo-copied pages from 1 Nephi. The LDS missionaries that shared this with him never returned but he has taught what he had at his school. Eventually he got in touch with the Church of Christ and the Temple Lot group and requested a copy of the Book of Mormon from them. Six years on and still no Book of Mormon. David's faith and persistence found a friend in Tony. They email back and forth on a daily basis. Tony mentioned the request for scriptures on our fellowship forum, I requested a set of scriptures and we shipped them to Nigeria via UPS. Today was a box full of light and truth for David! Here he is with his own copy of one of the most profound books in print on this planet. Some joyful day we will meet David and his family and embrace one another as brothers and sisters in Christ.